The Black Eclipse is a well padded bar stool with an intriguing shape – excellent levels of comfort and superb styling combined! The graceful arc of the back rest sweeps down to meet the sides of the seat in an attractive design which gives an air of movement. The whole seat is thickly padded with high density foam and then covered in premium black faux leather which is hard wearing and easy to care for. You can adjust the height up to 20cm and rotate through a full circle. 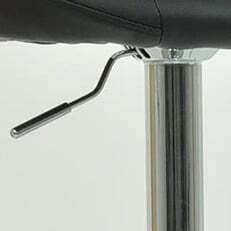 The base section is all chrome plated and includes an oval footrest attached to the supporting column and floor protection is fitted beneath the circular base. The Black Eclipse matches our Black Circles dining chair, enabling you to create a unified theme for all your seating, or you can use it alone to bring luxurious comfort and an air of sophistication to your counter or bar.